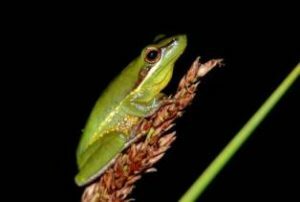 The wallum sedge frog is a small, colourful native amphibian found in lowland wallum habitat in coastal regions of Queensland and New South Wales. Vulnerable due to the rapidly increasing urban spaces on the Sunshine Coast, the wallum frog requires mildly acidic habitat conditions and semi-hollow wetlands, and is commonly found in wallum heath or sedgeland environments. Despite frequent land clearing, a variety of climatic events over the last 50-60 years in Caloundra has contributed to the rise of groundwater table, the presence of naturally acidic soils and a break in the drought. Working closely with Traditional Owners, these improved environmental conditions allowed Healthy Land and Water to deliver the first phase of the Sunshine Coast Frog Habitat Restoration project in March 2018 alongside project partner Stockland. In an effort to offset the environmental impacts of Stockland’s nearby Aura development, 820 rushes and sedges were planted in the 700-hectare Aura Conservation Zone on the Sunshine Coast. The project is part of Stockland’s Aura Community Stewardship Program. 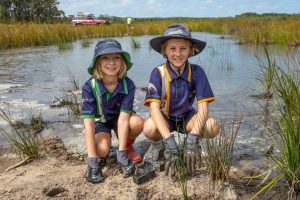 In March 2019, the second phase of the project was launched in which over 750 new sedges and reeds were planted by students from Unity College and Baringa State Primary School. Designed to protect acid frogs’ vital habitat and provide frogs with an ideal breeding ground, particularly the wallum sedge frog, the project is an example of efforts to address the loss of habitat by continuing to establish a ‘frog highway’ that allows the frogs to move freely. Today, the rushes and sedges planted in 2018 are well established, and the breeding pond is providing vital habitat for vulnerable species including the wallum sedge frog and many other birds, butterflies and small native mammals.